Earliest archives that document Jewish presence in Hungary are dated back to the time of the reign of Stephan I., the first Christian king of Hungary. In the first 300 years of the Hungarian state (1000-1302), Jews’s position was better than in Western Europe, as kings needed them for building the feudalistic society of the country. In this period Christian an Jewish schools developed paralelly – in these schools pupils learned to read and mostly religious knowledge, but in Jewish schools also matehmatics and languages. One can find archives from the middle of the XIII. century about 5 Jewish schools („scholae Judaeorum”). In the years of 1300, after dying out of the ancient Hungarian royal family, Anjou kings reigned the country. They made way for religious intolerance. Jews were expeled several times from the country, they were obliged to wear condemning hat and to live in ghetoes. In the XIV-XVII. century position of Jews became worse step by step. In this period cheders and jeshivas were documented in the ghetoes of several big towns (e.g. in Pressburg), but paralelly with expansion of discrimination melameds and bochers delt mostly with Talmud. During the 150 years of Ottoman Rule, Jews had approximately good position. They took part in economical life and had their own community with schools. This life collapsed again after hounding out the Turkish by the Habsburgs. The XVIIIth century brought the Enlightenment into the Habsburg Monarchy. The emperor Maria Theresia reorganized the educational system with publishing Ratio Educationis in 1777. In this, she modernized and unified the syllabus with compulsory elements like teaching German language, sciences, phisichs. The decree regulated methodology and teacher training with establishing „norma-schools” where all the teachers had to spend a year to learn the methods. All the progressive changes caused by the Enlightenment didn’ effect the position of Jews. On the contrary, they had to pay special taxes, were forbidden to settle in mine-towns. Neither the Ratio Educationis didn’t apply to them. Emperor Joseph II. wanted to create a unified empire. In his concept there were no ethnical or religious differences between citiziens. Therefore he wanted to integrate Jews among the citiziens of the Habsburg Empire. His „Edict of Tolerance” was issued in 1783. In this he allowed Jews to rent fields and do agriculture, to settle in every town, to be in trades whatever they wanted. The edict delt also with the schooling possibilities of Jews. The decree made Jews to take part in state-controled education. They were obliged to establish schools according to the directives of Ratio Educationis. They had to teach in German, use the same textbooks than in all other schools. For keeping religious tolerance, he ordered to remove all the Christian religious texts from these textbooks. The new Jewish secular schools had to employ theachers trained in norma schools. The lessons for Jewish studies were regulated in the same way than in Christian schools – it was still the most important part of the syllabus. The aims of Joseph II. in the field of integration of Jewish education into the Monarchy’s school system met the ideology of Moses Mendelsohn’s Jewish Enlightenment. These two ambitions led together to the formation of Jewish secular dayschools folowing state edicts, state syllabus and adapting to the Hungarian educational system. The first dayschool was opened in Nagymarton, near the Astrian border in 1782., and the first Jewish National Norma School in Pressburg in 1783. Soon after it, 20 Jewish dayschools were established in Hungary. This period of prosperity and emancipation was too short – Joseph II. died in 1790., and his successor Franz I. followed conservative principles. The Jewish dayschools were not supervised any more by the state but the Chatolic church. Most of these schools lost their students and had to close. In the period of 1790-1811 Jewish education turned back to the traditional cheders. From the years of 1810 a long polem began between leaders of Jewish ideological tendencies about the education of Jewish children. The conservative platform was against every form of assimilation, and so the secular Jewish schools as well. The progressive platform, whose members wanted to integrate into the new, bourgoises Hungarian society, argued for new Jewish dayschools, where modern, secular subjects would been emphasized besides traditional religious themes. Like a compromission some rabbies began to translate T’nach and also wrote textbooks for teaching biblical stories. The first result of the struggles was the establishment of the Jewish Elementary Dayschool for Boys in Pest in 1814 and in Pressburg in 1820. In the next decades towns and villages in different parts of Hungary established Jewish dayschools in contest with each other. They all had their own syllabus according to the state syllabus and according to the expectations of the locals Jewish community. Subjects were similar everywhere: Judaism; Hebrew; Hungarian and German reading, writing, grammar; secular subjects as mathematics, history, geography. In 1844 24.000 students learned in 200 „Jewish national dayschools”. These decades were period of strenghtening of Hungarian national consciousness. Jews struggeling for emancipation felt teaching Hungarian language very important. Jews took part in the revolution and war of independence against the Habsburgs in 1848/49. After it’s failure, in the fifties the Jewish communities of Hungary had to pay a huge amount of war idemnity. Later it was spent on a Jewish Educational Fund for financing Jewish dayschools, teacher training and establishing a rabbinic seminar (as it happened in 1877.). To take part in the unification of the whole empire, Jewish communities were pressed for opening schools. The result was more than 300 new, modern Jewish dayschools, teaching Hebrew and Torah as well as German and other secular subjects. Hungarian and Habsburg leaders made a contribution in1867 about the authonomy of Hungary in the Habsburg Monarchy. The minister for education of the first Hungarian government was Joseph Eotvos, a philosopher and writer, who had settled liberal and modern concept for the country’s new school system. The most improtant features of his law were: compulsory education, establishing public schools besides those ruled by curches, new syllabus, emphasizing Hungarian language and secular subjects. It ordained about the minimal requirements of school buliding, hygienic circumstances, textbooks and demonstrational equipments. Regulation for religious schools can be found in this law, as they had to follow the national syllabus in case of secular subjects, and the prescribes about the teaching circumstances. Churches had authonomy in choosing teachers and planning the curricula of religious studies. This period was ambivalent for the Jewish community. The law about emancipation of Jews was issued in 1867 and that about emancipation of Jewish religion, in 1895. In the same time new, political antisemitism rised. Not even the Jewish community was unified – it splitted into 2 major parts: neolog and orthodox in1871. All these effects yield the flourishing of Jewish education. Almost 500 schools worked in the country folowing more or less the ministrial orders. Dozens of new textbooks for Jewish schools were published. Teaching level was high in most of them, several officials visited these schools and spoke highly about their results in the reports. The establishment of Jewish secondary education was first suggested in 1862. A great number of Jewish scholars and professors supported the idea. Leading rabbies issued the country-wide syllabus for religious education in 1891. It had different chapters for Jewish elementary schools and for children attending non-Jewish schools. Several Jewish child care institutions were active on the turn of the century: in the school for blind or deaf children remedial teachers folowed the most modern methods and helped their students to learn how to live their own, independent life. One could find orphanages and homes for apprentices and holiday homes in the countryside for orphans and poor children. The end of the I. World War brought the collapsing of the Monarchy: two revolutions: a democratic in 1918. and a communist in 1919. and 50% dismembering of Hungary with the Trianon peace decree in 1920. These circumstances were ideal for the rising of antisemitism. Phisical attrocities first and several antisemitic orders (like Numerus Clausus in 1920., which limited number of Jewish university students in 6%) made life of Jews more and more threatened. In this athmosphere, it became timely to establish Jewish secondary schools. The period between 1920 and 1944 was the most strange and ambivalent one in Hungarian Jewish education. In the shadow of discriminative voices, decrees, laws and actions Jewish cultural life, youth companies and first of all Jewish schools flourished in big towns of Hungary. 15 elementary schools worked in Budapest along these decades, 10 secondary schools (2 in Budapest and 8 in the countryside) and from 1938 vocational schools, too. The Jewish Grammar School of the Pester Jewish Community opened up in 1919. The building (opened in 1923.) was of up to contemporary expectations was equipped with library, science labs, art and music studios, gymnasium with locker rooms and showers and outdoor sportground. It also had an own synagogue, where shabbat services were kept with participation of the students..
During the 30s and the war the school was like a shelter. Students and teachers could feel them secure here. University professors, who lost their job because of the „Jewish laws”, taught in the Jewis Grammar School afterwards. Everybody felt that their only possession was knowledge - so the education was on high level. Number of students rised more and more. Due to the Holocaust number of students reduced drastically (1449 students were registrated at the begining and 795 at the end of the 1944/45 school year. ) A lot of the students made aliya. After 1948 religious schools in Hungary were secularized. Only 10 schools were allowed to remaine in denominational maintenance – one of them was the Jewish Grammar School. But one who attended a religious school became handicapped when going to the university - so only a few students went to the Jewish Grammar School. In 1952 the pride of Hungarian Jewry, the building in Abonyi street was secularized. The sublease in the building of the Rabbinic Seminar wasn’t suitable for a well functioning school. The school got the name „Anna Frank Grammar School” in 1965. In this period, the social and cultural life of Jews in Budapest was concentrated around special places and occasions - two of them were the Chanukka and Purim bal organized by „Anna Frank”. The students and especially the choir took part of spreading Jewish music, dance and literature. In the 80s the number of the students slowly began to grow. In 1990., after the changing the regime, the Jewish education revived. (Two other schools, kindergartens, summer camp, community center, several youth organisations have helped formal and informal education since then.) The Anna Frank School had more than 120 students, and got a new, modern building, ready for the 21th century, what was financed from the compensation of the „ Abonyi ” received from the state. 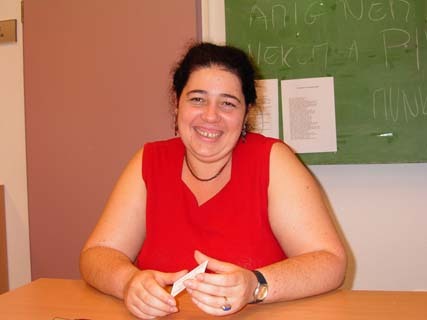 The new, 12 grades school is now wearing the name of Sándor Scheiber, who, as the director of the Rabbinic Seminar, was an internationally respected scientist of Jewish and folk studies. The Scheiber School now has almost 400 students. The Jewish Grammar School will celebrate it’s 85th anniversary in the Scheiber School, on the 5th of september. It’ll be the celebration of surviving all the storms of history.